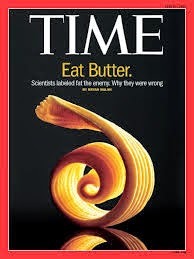 HEALTHY DIETS AND SCIENCE: TIME magazine article says butter and saturated fat is good for you! TIME magazine article says butter and saturated fat is good for you! This is the headline in the latest TIME magazine by Bryan Walsh. The medical reporter on the Today show said butter, chicken skin or any type of saturated fat is good. She explained that saturated fats raise levels of benign large fluffy LDL cholesterol, and that refined carbohydrates raise levels of the dangerous small dense LDL cholesterol. Bryan may have read the scientific evidence in my book: "Cholesterol and Saturated Fat Prevent Heart Disease"